Earlier this month I reported on wines from Chile’s coastal climates, based on a fascinating series of tasting events staged for the wine press and trade by South American wine producer, Santa Rita. The Santa Rita group operates several wineries and produces a number of different wine ranges from estates in both Chile and in Argentina. In this second report from their event held in London in January 2013, the focus was on terroir, putting a small sub-region of Mendoza called Gualtallary under the microscope. 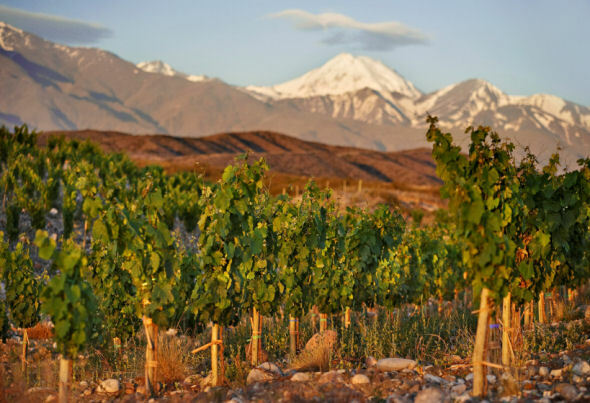 Gualtallary, lying in the Uco Valley close to Tupangato, is thought to be an exceptional terroir, and one in which Santa Rita’s Doña Paula estate has placed huge faith by buying 135 hectares of land which it is planting with bush vines. The soil is calcareous, very sandy and rocky, and one of the poorest in the Doña Paula portfolio. The average annual rainfall is only 280 mm (11.02 in). In terms of Growing Degree Days (see wines from Chile’s coastal climates for a detailed explanation), it is a hot region as can be seen from the chart above. Its 1780 Growing Degree Days is more than Tuscany, Rioja and the Southern Rhône, and around the same as the Napa Valley. However, whilst Napa’s vineyards lie at only 248 metres above sea level, Gualtallary is at 1,300 metres, or almost 4,400 feet. It is in fact one of Mendoza’s coolest zones and Finca Sophenia and Catena are amongst other significant investors in this region. Eight wines were presented for tasting, all coming from Gualtallary, three white and five red. Some of these wines are not available in the UK, but I have given worldwide wine-searcher links for those keen to track any of them down or see indicative prices. 12.5% ABV. Half of this wine was fermented in concrete ‘eggs’, half in stainless steel. It is not at all ostentatious, focused on tight apple and melon skin aromas. On the palate there is gorgeous purity: lime and lemon, touches of herbaceous character, but really punchy and dry into a finish showing some chalky minerality. 90/100. See worldwide stockists on wine-searcher. 12.8% ABV. From low-yielding bush vines planted in stony soils, it is 65% Riesling and there is 5% of Chardonnay in the blend too. Much more terpene, leafy and floral-touched character, some melon or citrus skin too. Dry, with a lemon sherbet bite on the palate, this is firm and again with a steely core of acidity. Not released. 89/100. 14% ABV. From selected rows of the high Adriana Vineyard rich in ‘pudding’ stones, this is fermented and aged 16 month in French oak barriques. It has a ravishing oatmeal and honey, almond-touched silkiness on the nose, sitting alongside really juicy, fresh apple fruit. On the palate the oak is quit powerful – perhaps a touch overdone – but the concentration of fruit pushes through, sweet on the mid-palate and running into dry, pithy, very streamlined and elegant acidity. 92/100. See worldwide stockists on wine-searcher. 14% ABV. Though this wine is listed as Cabernet Franc, it’s technical sheet says it is 55% Malbec and only 45% CF. The two varieties are co-fermented using native yeasts, and aged in French oak (one-third new) for 12 months. It has an absolutely gorgeous nose with cherry blossom, sweet menthol in the background and leafy notes all adding to the berry fragrance. Deliciously dry, lip-smacking palate with plenty of juicy black fruit that is supple and spicy too, and whilst the fruit and oak hints at espresso depth, it is beautifully fresh and alive. Not released. 92/100. 14% ABV. This wine is 100% Cabernet Franc, again a clonal selection of French bush vines planted into the sandy and rocky soils of the Gualtallary vineyard. Aged in new French oak barrels for 12 months. It has such a vivid, deep purple/black colour, and a lot of depth on the nose too: smoky and earthy, but not too toasty or obvious, blending nicely with deep plum fruit. On the palate it is vinous, with a cherryish edge to the fruit, a light and bright herbal character keeping it lively and fine. Arguably a little more solid than the Demente, but deep, rich and with meaty savour too. Not released. 91/100. 13.8% ABV. From a 15-year-old vineyard planted at 1350 metres, this sees no oak but is fermented with wild yeasts and aged in concrete tanks. This is a very dark and meaty take on Malbec, pepper, spice and a certain muscular rather than Malbec’s floral quality. On the palate it is relatively solid and foursquare too, but what a depth of fleshy, plummy fruit. Tannins give a nice roughening grip, but the sweetness of the fruit really persists and it does retain very good freshness. 89-90/100. See worldwide stockists on wine-searcher. 14% ABV. Catena say the soils here are 90% sand covered with stones. Unusually for a red wine it is fermented in all new French oak barriques, which winemaker Alejandro Vigil says makes for “seamless oak integration.” It is another wine with a gorgeous fragrance. It is creamy and a touch coffeeish, but with beautifully refined and ripe black fruit aromas, a real suggestion of blue-black, silky concentration. Indeed that is what the palate delivers, a plush mouthful of rich but not heavy black fruit, nicely alive with kirsch and strawberry creaminess. The tannins are chocolate smooth and acidity well handled too in a hugely sophisticated wine. 93/100. See worldwide stockists on wine-searcher. 14.5% ABV. The soils where this bush vine vineyard is planted is made up of medium-sized alluvial stones, chalk and sand. It too is vinified in barrels and aged in new French oak for 14 months. Again fantastic saturation of colour and a fine, cedary, smoky aromatic with tobacco and lightly herbal notes, earthiness and a core of ripe blackcurrant. Lovely palate, quite serious and sinewy, but blackcurrant and fleshy plum fruit depths too. It has real juiciness and a roughening, plum-skin rasp to the tannins that keeps it lively and savoury in the mouth. 91/100. It is impossible to say from this experience that I found anything unique about the character of the wines, but there was an exemplary freshness to all of the examples, even though the grape varieties, styles and alcohol levels varied greatly, from 12.5% to 14.5% ABV. It was certainly a convincing argument for the quality of this terroir.